"Chocolate spritz cookies for use with a cookie press! 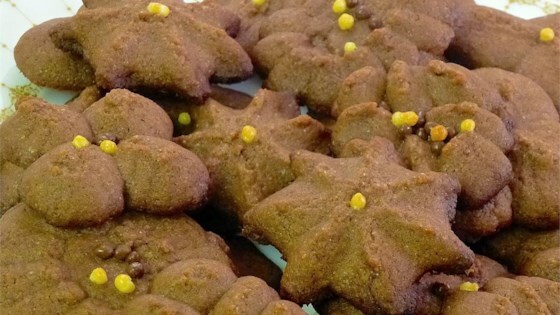 This recipe makes lots of cookies." Beat butter in a large mixing bowl using an electric mixer until creamy; add sugar, cocoa powder, and baking powder. Beat until combined. Scrape sides of bowl down if needed. Stir egg and vanilla extract into butter mixture until just combined; mix in flour. Fill the cookie press with dough; press cookies onto an ungreased baking sheet. Bake in the preheated oven until edges of cookies are lightly browned, 8 to 10 minutes. I love this recipie. it is good on its own but I added 2 tsp of vanilla and 2 tsp of almond extract. they turned out very very yummy and worked so perfect in my cookie press. They taste chalky, not chocolatey, and I even left out a little bit of the flour. Disappointed. Nice chocolate-y butter cookie. Simple to make and cooked perfectly in 8 minutes. Definitely will be saving this one for the Holidays. Thanks Christy for sharing your recipe.